It was only a few years ago that the need to become “a content marketer” showed up as a priority for demand generation teams. While that priority hasn’t gone away, marketers now face the additional challenge of “creating more engaging content” to rise above all the content noise. There is no better way to do that than by adding video to your marketing mix. What was once a very expensive and time consuming media is now inexpensive and easy. We’ve entered the “Vigital” age for interacting with prospects and buyers. 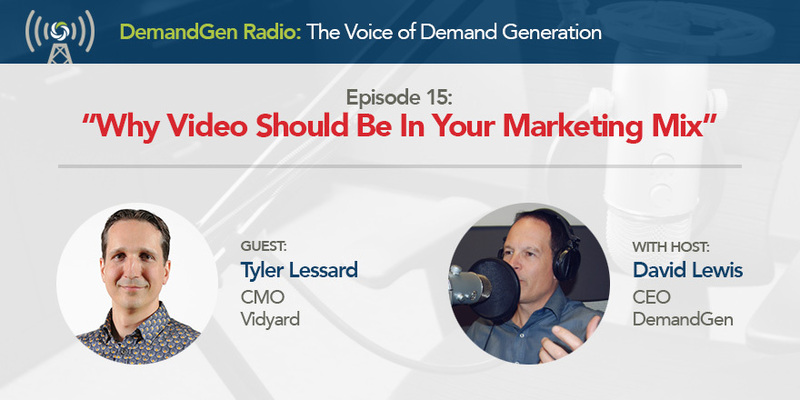 In this episode of DemandGen Radio, David talks with Tyler Lessard, CMO of Vidyard about how to get started in video creation and the benefits of using a platform like Vidyard for creating, publishing, personalizing, and tracking the impact of your video content.